This article by Douglas O’Neill was originally published on the website Vox Humana, and is here reproduced by permission of the editors, with our thanks. Charles Tournemire (1870-1939) completed his monumental project L’Orgue Mystique on February 5, 1932. It is unparalleled among Roman Catholic organ music; Tournemire had desired to do for the Roman Catholic Mass what J.S. Bach had done for the Lutheran Mass with his Orgelbüchlein. It is a set of 51 suites for nearly every Sunday and select feast days of the church year. Gregorian chant permeates Tournemire’s music, with motives drawn from the appointed proper chants for the day. Each suite consists of five movements: a “Prélude à l’Introït,” “Offertoire,” “Élévation,” “Communion,” and “Pièce terminale”. The Roman Rite was substantially changed with the issue of the 1969 edition of the Roman Missal after the Second Vatican Council (1962–1965). This new order of Mass is variously known as the Mass of Paul VI, the Novus Ordo, and now the Ordinary Form of the Mass. The Mass adopted a new three-year lectionary cycle, and with it the proper chants for the Mass were re-ordered to coincide more closely with the readings. The official book of proper chants for this new Mass, the Graduale Romanum, was published in 1974. One might be tempted to think that this radical overhaul of the Mass propers might condemn Tournemire’s massive project to the dustbins of history. Pope Benedict XVI’s Summorum Pontificum of 2007 liberalized the permission to use the old Tridentine Mass, now known as the Extraordinary Form of the Mass; thus, musicians who serve communities that offer this Mass may use this music in its original context. Nonetheless, the Ordinary Form remains the norm, and so this article will focus on how to incorporate this music into the commonly celebrated form of the Mass. For each piece of the suite, I will cite current liturgical law and suggest how the music might be used in the “new” Mass. I will rely on two magisterial documents (that is, documents approved by the Holy See): Musicam sacram of 1967, the only post-Vatican II magisterial document that specifically concerns liturgical music; and the General Instruction of the Roman Missal (hereafter GIRM) in its 2011 edition. The reader may wonder why I choose not to include two other documents: Sacrosanctum Concilium from the Second Vatican Council, and Sing to the Lord: Music in Divine Worship. Sacrosanctum Concilium, known in English as the “Constitution on the Sacred Liturgy”, is a seminal and highly important work, but is largely philosophical, with broad general concepts. Musicam sacram more specifically applies that philosophy to regulations concerning music for the Mass. Sing to the Lord was issued by the United States Conference of Catholic Bishops in 2007, and as such contains guidelines for liturgical music in congregations of the United States. This document to this date has not received official approval from the Holy See, and so remain guidelines (except where rooted in magisterial documents) rather than liturgical law. As well, this article seeks to suggest worldwide use of L’Orgue Mystique. 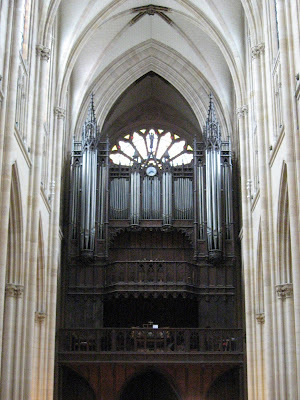 The 1863 Cavaillé-Coll organ at Ste-Clotilde in Paris, France, where Tournemire played. The first piece of each suite is a brief piece based on the Entrance Chant for the Mass. The old High Mass would customarily begin with the Rite of Sprinkling, accompanied by the singing of the Asperges. After this, the procession would return from the main nave of the church to the sanctuary, upon which the celebrant would remove the cope and vest in the chasuble. Then he would go to the altar for the singing of the Introit. 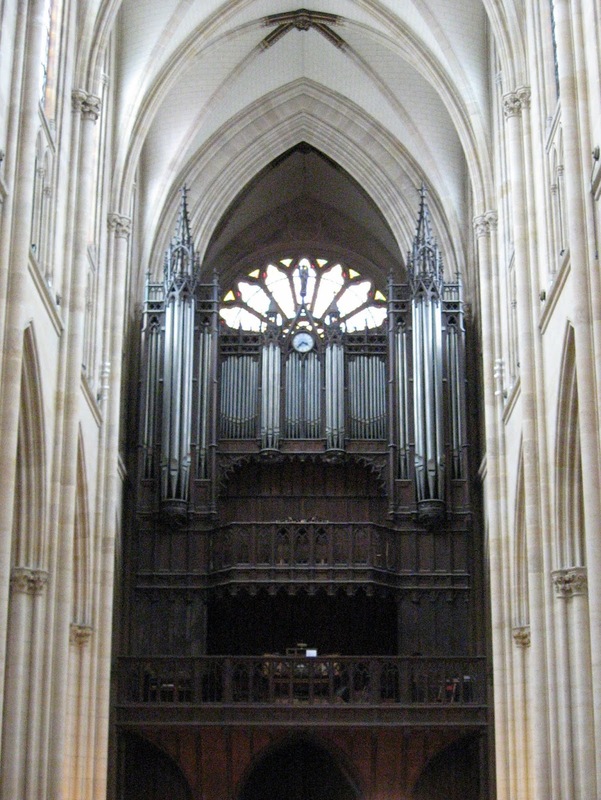 The organist was permitted to play an interlude during the time between the end of the Asperges and the beginning of the Introit, which is the original purpose of Tournemire’s Prélude à l’Introït. 48. This chant is sung alternately by the choir and the people or similarly by a cantor and the people, or entirely by the people, or by the choir alone…. If there is no singing at the Entrance, the antiphon given in the Missal is recited either by the faithful, or by some of them, or by a reader; otherwise, it is recited by the Priest himself, who may even adapt it as an introductory explanation. GIRM 47 mentions a fourfold purpose of the Entrance Chant, none of which would preclude the playing of organ music before the Introit. It also says that the Entrance Chant begins as the procession commences. However, it seems not to rule out an extended organ introduction to the singing of the Introit. GIRM 48 concerns more specifically the method of the Entrance Chant, and permits a choral-only rendition of the Gregorian Introit upon which the Tournemire piece is based. For those congregations that wish to incorporate congregational participation in the Entrance Procession, a short congregational antiphon could be added. Concerning chants in English, the work of Fr. Columba Kelly, OSB; Adam Bartlett; Fr. Samuel Weber; and Richard Rice are especially to be commended in this regard. Their settings tend to use the same modes as the Gregorian Introits. This allows various possibilities for seamless musical transitions between Tournemire and the singing, when the starting pitches of the chants are matched to the organ piece. There would be a few options for its use in the current Mass: as a Prelude before the Mass, after which the Introit would be sung during the Entrance Procession; during the Entrance Procession, followed by the singing of the Introit; and music covering the entire Entrance Procession, with a spoken Entrance Antiphon. Of the four movements from the suites, the Offertory is perhaps the easiest to incorporate into the Ordinary Form Mass, as the chants are often retained from the earlier Tridentine Mass. Musicam sacram makes clear that solo organ music is permitted at this time, and the GIRM regards the guidelines for the music to be identical to those of the Entrance Chant. Tournemire intended that the music be played following the singing of the Offertory Chant, and this practice may be followed. In addition, it could follow the singing of a vernacular chant of the same mode or be played without the chant being sung. This is the one movement that has no equivalent in the Ordinary Form Mass. 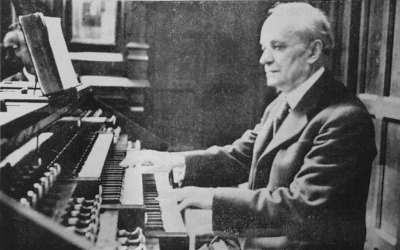 It was customary for some churches in France to have organ music at the consecration and elevation of the host, though some clergy preferred silence. After the elevation, the celebrant would conclude this portion in a subdued voice, and organ music was permitted during this short time. Even before the Mass of Paul VI was promulgated, a 1958 instruction during the pontificate of Pius XII effectively ended the practice of having music during this time, and this guideline has continued to the present day. Organists who wish to play the Elevation pieces could incorporate them as part of a prelude before Mass, but not in the context of its function as Tournemire intended. For this reason, they are not included in the chart at the end of this article. Tournemire’s Communion pieces are based on the appointed Communion chant for the day. Many of the Communion chants in the 1974 Graduale Romanum vary according to the three-year lectionary cycle. For instance, the communion piece in Office 9 paraphrases Dicit Dominus: Implete, which now is appointed for only Year C on the Second Sunday of Ordinary Time. The chant for Year A, Laetabimur in salutari, appears in the 1961 Graduale Romanum for Tuesday of the Fourth Week of Lent, and Year B’s Dicit Andreas Simoni for the Vigil of the Feast of St. Andrew. Tournemire intended that the Communion piece be played following the Agnus Dei, thus beginning the music for the distribution of communion. The singing of the communion chant would follow. While the Priest is receiving the Sacrament, the Communion Chant is begun, its purpose being to express the spiritual union of the communicants by means of the unity of their voices, to show gladness of heart, and to bring out more clearly the “communitarian” character of the procession to receive the Eucharist. The singing is prolonged for as long as the Sacrament is being administered to the faithful…. Care should be taken that singers, too, can receive Communion with ease. …. if there is no singing, the antiphon given in the Missal may be recited either by the faithful, or by some of them, or by a reader; otherwise, it is recited by the Priest himself after he has received Communion and before he distributes Communion to the faithful. Here, the GIRM specifies that the chant should begin as the Priest receives, rather than after, as was the former practice. Although some would claim that the mention of “unity of their voices” would preclude any instrumental music, or indeed a choral-only rendition at all, it should be noted that these are not specific guidelines, but rather broad expressions of purpose. It is left to those planning the liturgical music to decide if organ music fulfills the “spiritual union of the communicants.” The GIRM also mentions that the “singing is prolonged” for the duration of the communion procession, but that does not rule out the possibility that organ music could prolong the singing; the singing need not be continuous. Organ music could, in fact, enable the singers to “receive Communion with ease.” The following paragraph implies that singing is not necessary at all, as is the common practice at daily Masses. Feasibly, organ music could be played during the Communion procession, with no singing at all. In my experience, the following scheme works well: (1) The choir/schola sings the Communion antiphon. (2) The organist plays Tournemire’s setting of the communion chant while the choir receives Communion. (3) The choir/schola again sings the communion antiphon, alternating with psalm verses. A short vernacular antiphon involving the congregation, in the same mode as the Gregorian chant, could also be incorporated if so desired. Tournemire avoids the use of the common French term “Sortie,” as it connotes a purely functional role as “exit music.” Rather, he refers to the movement as the “final piece,” which implies a work of more substance. Robert Sutherland Lord writes that “Tournemire seemed to have envisioned a period of meditation for the devout at the conclusion of the Mass rather than the usual noisy and hurried movements of the congregation toward the door.” Unrestricted by time constraints within the Mass, these pieces are lengthy and complex, frequently quoting chants from the Gregorian Gradual and Alleluia of the Mass (normally replaced in most celebrations of the Ordinary Form Mass by the Responsorial Psalm and a simpler congregational alleluia, although they are technically still permitted), as well as hymns and antiphons sung at Lauds and Vespers. Musicam sacram mentions the possibility of solo organ music “at the end of Mass.” The GIRM makes no mention of what happens at this point, as the Dismissal formally concludes the Mass itself. While it has become customary in many parishes to sing a hymn after the Dismissal, this practice is hardly required. Because Tournemire’s pieces often do not begin in a boisterous manner, they tend to sound anticlimactic after a final congregational hymn. They more appropriately commence immediately following the Dismissal, accompanying the retiring procession and continuing as the congregants leave the church, or choose to stay and listen while meditating. With this chart, I hope organists in Catholic churches around the world will incorporate L'Orgue Mystique into the Ordinary Form Mass. First Prize Winner of the 1999 Dublin International Organ Competition, Douglas O'Neill is an active performer on organ, piano, and harpsichord, as well as a church musician and choral conductor. He holds degrees from the University of Evansville, the University of Iowa, and the University of Kansas, where he completed the DMA in Church Music. His principal teachers have been Douglas Reed, Delbert Disselhorst, and James Higdon. Douglas has performed solo and collaborative concerts in the United States and Europe, including the Dublin International Organ and Choral Festival. He has also performed at regional and national conventions of the American Guild of Organists, the American Choral Directors Association, and the International Trumpet Guild, as well as with the Utah Symphony Orchestra. He has previously served as Assistant University Organist at the University of the South in Sewanee, Tennessee, on the faculty of the University of Evansville, as Associate Organist and Director of the Organ Academy at Saint Cecilia Cathedral in Omaha, and as Organist and Assistant Director of Music at the Cathedral of the Madeleine in Salt Lake City. His responsibilities at the Madeleine included playing for daily liturgies at the Cathedral, managing the acclaimed Eccles Organ Festival, and teaching at the Madeleine Choir School, the only full-time co-educational Catholic choir school in North America. 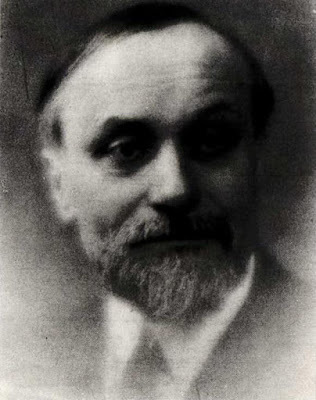 He also prepared numerous editions of chant and polyphony, as well as compositions and orchestrations for performance by the choirs of the school and Cathedral. In addition to his prizewinning effort in Dublin, he has participated in the Grand Prix de Chartres, the Concours internationaux de la Ville de Paris, and the RCO Performer of the Year Competitions, and was a finalist in the Grand Prix Bach de Lausanne competition.